Jackson, Jenn M. 2018. Black Americans and the “crime narrative”: comments on the use of news frames and their impacts on public opinion formation. Politics, Groups, and Identities, p. 1. Butler, Ryden Nyhan, Brendan Montgomery, Jacob M. and Torres, Michelle 2018. Revisiting white backlash: Does race affect death penalty opinion?. Research & Politics, Vol. 5, Issue. 1, p. 205316801775125. Hutton, Erica 2017. Police Brutality, Racial Profiling, and Discrimination in the Criminal Justice System. p. 296. Crichlow, Vaughn J. and Fulcher, Christopher 2017. Black Men Down: An Assessment of Experts’ Quotes on Deadly Encounters with Police. Race and Social Problems, Vol. 9, Issue. 3, p. 171. Baxter-Moore, Nick Eagles, Munroe Aheer, Dupinder Maxwell, Racquel Pilkey, Lisa-Anne and Samra, Kimmy 2016. Explaining Canada–US Differences in Attitudes Toward Crime and Justice: An Empirical Test of S.M. Lipset’s Account. American Review of Canadian Studies, Vol. 46, Issue. 4, p. 430. Dixon, Travis L. and Linz, Daniel. 2000. “Overrepresentation and Underrepresentation of African Americans and Latinos as Lawbreakers on Television.” Journal of Communication 50(2): 131–54. Ghandnoosh, Nazgol. 2014. 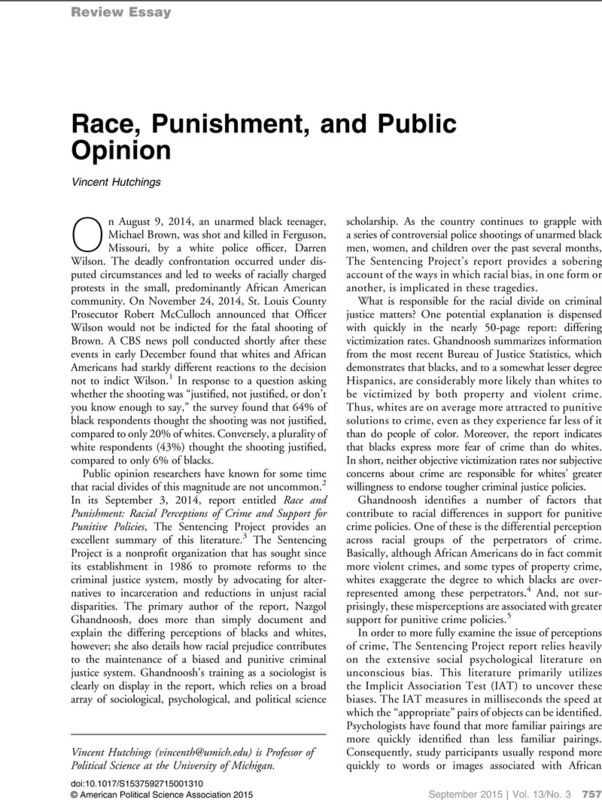 Race and Punishment: Racial Perceptions of Crime and Support for Punitive Policies. Washington, DC: Sentencing Project. Goff, Phillip A., Eberhardt, Jennifer L., Williams, Melissa J., and Jackson, Matthew Christian. 2008. “Not Yet Human: Implicit Knowledge, Historical Dehumanization, and Contemporary Consequences.” Journal of Personality and Social Psychology 94(2): 292–306. Goff, Phillip Atiba, and Jackson, Matthew Christian, Di Leone, Brooke Allison Lewis, Culotta, Carmen Marie, and DiTomasso, Natalie Ann. 2014. “The Essence of Innocence: Consequences of Dehumanizing Black Children.” Journal of Personality and Social Psychology 106(4): 526–45. Gwinn, Jason D., Judd, Charles M., and Park, Bernadette. 2013. “Less Power = Less Human? Effects of Power Differentials on Dehumanization.” Journal of Experimental Social Psychology 49: 464–70. Hetey, Rebecca C., and Eberhardt, Jennifer L. 2014. “Racial Disparities in Incarceration Increase Acceptance of Punitive Policies.” Psychological Science 25(10): 1949–54. Hutchings, Vincent L. 2009. “Change or More of the Same? Evaluating Racial Attitudes in the Obama Era.” Public Opinion Quarterly 73(5): 917–42. Kalmoe, Nathan P. and Piston, Spencer. 2013. “Is Implicit Prejudice Against Blacks Politically Consequential? Evidence from the AMP.” Public Opinion Quarterly 77(1): 305–22. Kinder, Donald R. and Sanders, Lynn M.. 1996. Divided by Color: Racial Politics and Democratic Ideals. Chicago: University of Chicago Press. Tali, Mendelberg. 1997. “Executing Hortons: Racial Crime in the 1988 Presidential Campaign.” Public Opinion Quarterly 61: 134–57. Nosek, Brian A., Smyth, Frederick L., Hansen, Jeffrey J., Devos, Thierry, Linder, Nicole M., Ranganath, Kate A., Smith, Colin Tucker, Olson, Kristina R., Chugh, Dolly, Greenwald, Anthony G., and Banaji, Mahzarin R.. 2007. “Pervasiveness and Correlates of Implicit Attitudes and Stereotypes.” European Review of Social Psychology 18(1): 1–57. Payne, B. Keith, Michelle Cheng, Clara, Govorun, Olesya, and Stewart, Brandon D.. 2005. “An Inkblot for Attitudes: Affect Misattribution as Implicit Measurement.” Journal of Personality and Social Psychology 89(3): 277–93. Peffley, Mark, and Hurwitz, Jon. 2007. “Persuasion and Resistance: Race and the Death Penalty in America.” American Journal of Political Science 51(4): 996–1012.